It’s a cool summer evening, and we are sitting in the drawing room in front of a fire. I’m reading The New Yorker. My husband is reading The (other) Spectator. He chuckles softly and I look up. He describes a cartoon. Two pigs are watching Wimbledon on television. One pig tells the other: ‘I like the grunting, but I find the tennis rather dull.’ I must have told the pig joke a dozen times by now, but it still makes me laugh. Which is unusual, because I rarely find the cartoons in The Spectator funny. Frankly, I’m amazed that we’ve muddled along all these years without getting the jokes. Even when The Spectator arrives, we go our separate ways. I read Taki and Jeremy Clarke (a wonderful writer) before turning to the lamentations of Theodore Dal-rymple and his views of the vulgar, coarse-grained and utterly stupid British lumpen-proletariat (it’s hell, but somebody has to read it). My husband reads Charles Moore and the book reviews. He thinks my devotion to Dalrymple reflects deep masochistic needs he’d rather ignore. As for The New Yorker, my husband no longer even gazes at the cover. 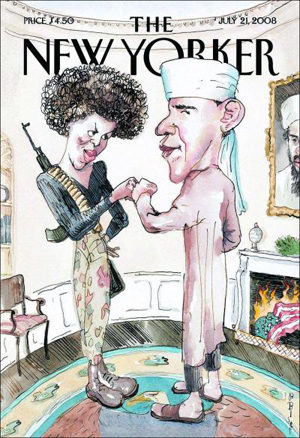 And it’s the cover of The New Yorker that I’m getting round to: yes, that cover, with Barack Obama in the Oval Office, dressed as a dishdasha Muslim terrorist, having a little fist kiss with Michelle, who’s decked out in combat boots, an assault rifle and a bandolier of bullets (see below). An American flag burns gently in the fireplace, a portrait of Osama bin Laden gazes into the room. Days before my July 21 issue arrived, I knew the Obama cover by heart.  It had appeared in every English newspaper and every online news site. My first look made me pretty mad. bulk’. Within seconds, I received one of those ‘out of office’ replies, an arch little message assuring me that New Yorker readers are so sophisticated they can discern that the cartoon was meant as satire. In case I lacked discernment, the note explained that the cover had taken the ‘distortions, lies and misconceptions about the Obamas’ and, by ‘exaggerating and mocking some things’, shown ‘what satire is all about’. Thanks. The reply didn’t begin ‘Dear Pious Nitwit’, but it left me feeling like the P. G. Wodehouse character who, ‘if not actually disgruntled, he was far from being gruntled’. The Fox Newsers and Karl Rovers who want to portray Obama as a closet Muslim don’t need help from The New Yorker. And whatever your politics, a flag in the ashes and bin Laden over the mantelpiece appearing on the newsstand the same week that nine American soldiers died in Afghanistan doesn’t tickle the funny bone. All the same, I didn’t join the angry hoards and cancel my subscription. No, I didn’t. The truth is, I don’t want this cartoon to become a WASP-ish version of the Danish cartoon saga. Did I find the cover ‘offensive’ and ‘racist’? During my southern childhood, I heard a lot of racist jokes. If you didn’t laugh, you were considered suspect. But the time comes when you find all tasteless jokes rather dull. When what you really enjoy is the subtlety and nuance of grunting.